Two North American T-28 Trojans find new life “down under” thanks to inspired owners and an experienced shop, Aerotec Queensland. AnnaMaria Handley provides us with an Australian success story. Davis Monthan Air Force Base is home to America’s retirement community for military aircraft. 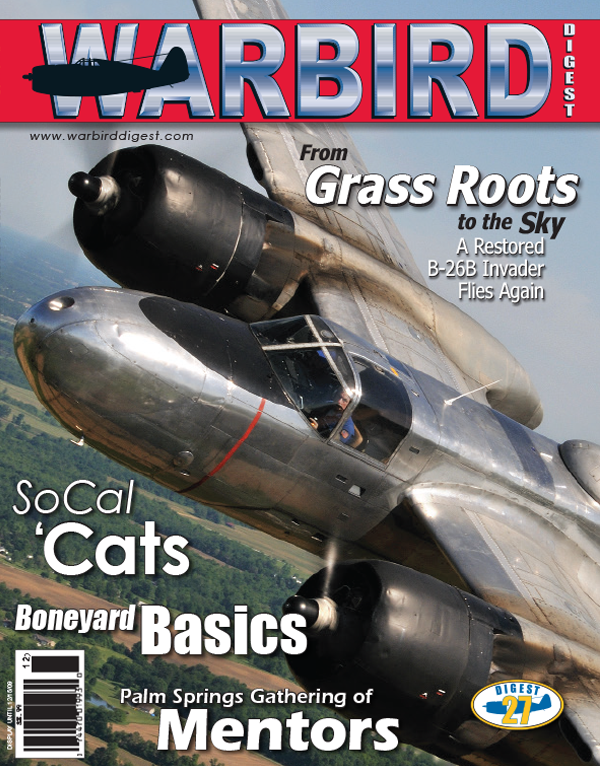 Greg Morehead reviews the significant role the boneyard has played over the past six decades, and he takes a critical look at the policies frustrating many in the warbird community. A small group of dedicated volunteers returned a military-correct B-26B Invader to the skies. Members of the Historical Aircraft Corporation in Lancaster, Ohio were up to the challenge, giving new life to an aircraft of the David Tallichet legacy collection. Rich Wallin shares his experience leading a flight of three vintage L-Birds into Washington Dulles International Airport. Planning and attention to detail made this flight into a high security airport possible, despite the post-911 era of hyper-security. Historic Ford Island, in the middle of Pearl Harbor, is home to the growing Pacific Air Museum and a unique restoration shop. Syd Jones and KT Budde-Jones explain what makes a visit to this facility unique and worthwhile. Scott Slocum brings us more great photography and tells us about Conrad Huffstutler, a 21 year old pilot who earned his sign-off and soloed in his Dad’s P-51 Mustang. It might help to have connections, but that doesn’t mean the expectations are any less demanding for the next generation of warbird pilots. Eric Van Gilder documented the 2009 annual gathering of T-34 Mentors in the Colorado mountains, which provided a beautiful backdrop for a challenging weekend of formation flying. The event also offered owners and pilots an opportunity to discuss T-34 wing spar modifications. Scott Germain’s fantastic photography leads the way in this visually stunning documentary of the 2009 Planes of Fame Airshow in Chino, California. The Grumman warbird theme provided rare formations and an unbeatable diversity of aircraft.